Stay Right Here a Little While...: KEN NORDINE'S "COLORS"
Ken Nordine's "Colors"(1966). Ken Nordine was a brilliant storyteller and poet of sorts, setting his improvised, stream of consciousness poems to the background of an in improv jazz ensemble. A sort of 'word jazz' if you want to call it that. His spoken word delivery is dry and his voice is deep and booming. The lyrics are sometimes silly, sometimes nonsensical, sometimes profound and always beat. Tom Waits has cited Nordine's work as a huge influence on him. 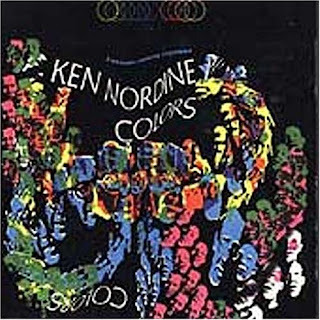 One of my favorite Ken Nordine albums is the psychedelic "Colors". It is a game of sorts; Nordine and his band gave themselves a minute and a half to improvise on thirty six colors, to come up with music and words to capture what it feels like to be each color. They do an incredible job of pulling off the mood and feel of each color. It would seem like listening to this album in it's entirety would become a bit tedious, but it is not. Every track is enjoyable, and you will find yourself wanting to go back and re-listen, to dig those crazy words and sounds of Ken Nordine. Highly recommended for those of you who are adventurous in your music listening. Here's "Flesh" and "Burgundy" for your enjoyment. Reminds me a little of the Mothers of Invention.